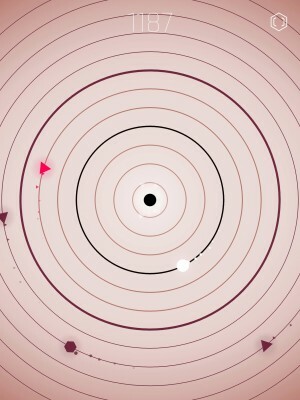 Orbitum (Free) by Happymagenta is a twisty little challenging arcade game. 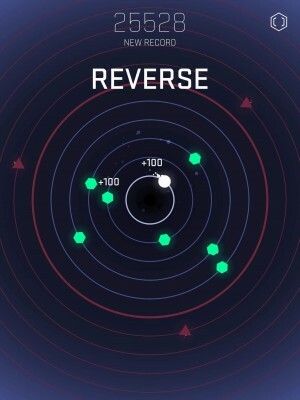 A challenge of keeping an orb from getting sucked into the central vortex by moving it outward, one orbit at a time, while collecting point orbs and avoiding obstacles and going too far out, this game can be rather rewarding once it is understood. Essentially, the trick to the game becomes about knowing where you are at all times. The orb will slowly be dipping back into the center as the circle it’s on gets smaller, but with less distance to travel, it can catch up to items on outer rings. But the problem is that the central vortex is killer. And you can’t go out too far, as some of the outer rings are dangerous to land on until they come in closer to the playing field, and they’re harder to get the point orbs on. It winds up being an interesting little bit of challenge because where you are in relation to the game world is a constantly-changing prospect. Your movement always needs to be compensated for something, be it for the differing positioning of each circle, trying to collect the green orbs, avoid the red triangles, or pick up the blue squares. 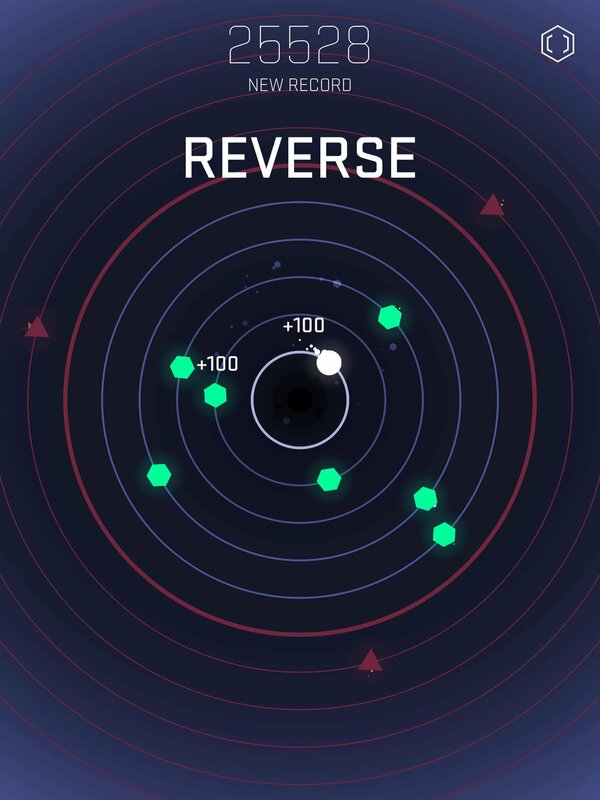 The red triangles are the game’s enemy, or at least the main obstacle that stands between getting sucked into the center vortex, and just being able to play for as long as possible. They pretty much just need to be dodged in the way that green orbs are not. But while they will lead to the most deaths, falling into the center vortex is still the main threat. It occurs with little warning while playing: it just kind of happens that, hey, you’re a lot closer to the center than you think. You waited on your ring to see if you could collect that green orb, and now you’re close to the center, and it’s over. There’s no flashing screen, no alert, it just gets sucked in. It’s even happened more times than I am comfortable admitting where I’ve fallen into the center shortly after starting. So yeah, get moving quickly. The blue squares offer either lucrative multipliers, a helpful shield, or a useless hyper jump that really doesn’t net any more points and seems to just advance the game to harder degrees sooner without the points that come from getting to that point naturally. Perhaps if it was a greater reward, like giving a much greater points bonus, or pulling in any items that fly by, would make it more worthwhile. The announcer of the game is an oddly-robotic female voice, and it’s naturally meant to recall Super Hexagon ($2.99) but with more of a sarcastic bent. I think the roboticness of the voice, possibly computer-generated, hurts that effect: it needs a bit more of a human snarl of aggressiveness to it. It’s just not dismissive enough. 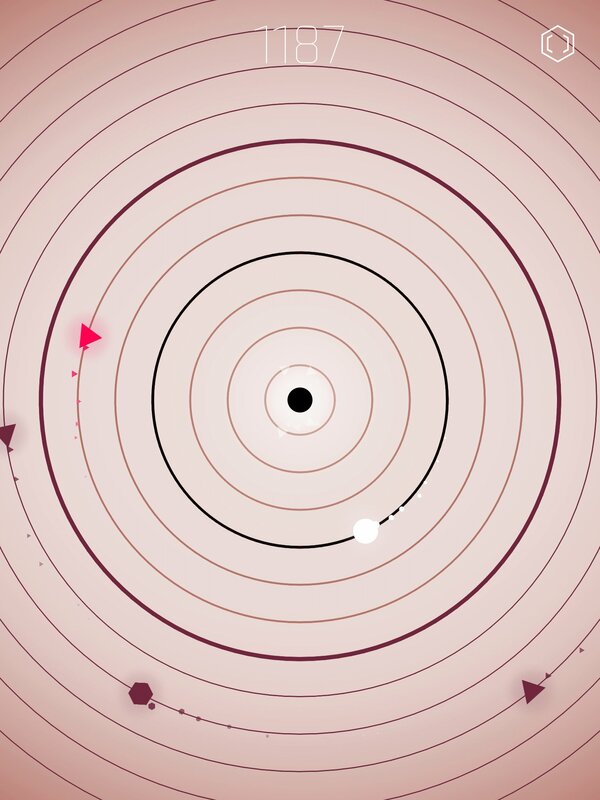 I think that the thing that makes Orbitum so compelling for me is that it is so punishingly difficult. Scoring is always a challenge, the game never lets me get comfortable at any point, and even punishes me for being too aggressive. It’s always an uphill climb, and it’s the kind of game where whenever I get a high score, I see where I am among friends and on Game Center. I want my performance to be great, because I feel like I had to work to earn it. I think that’s a great thing for a challenging arcade game like Orbitum to be. It’s perhaps not the simplest game to get into, as its concepts might take more time to master or understand than, say, Dextris or even Jupiter Jump (Free), but ti’s still a really satisfying experience nonetheless.